Lawyers have some company now. 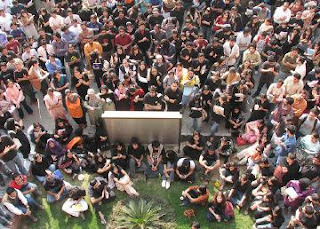 For the last two days, students from one of the most prestigious universities in Pakistan, LUMS (Lahore University of Management Sciences) have staged protests against the imposition of Emergency (read Martial Law) in Pakistan. Here are some pictures and you can read about the rally from, Emergency Times. Students are also protesting because two of their faculty members were picked up by police from the premises of the Human Rights Commission of Pakistan (HRCP). We are proud of our youth, the students. 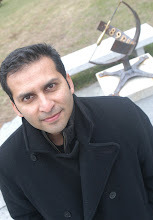 It started from LUMS to whom I solute first and then rigth up to small schools like Froebels and Headstart in Islamabad. It seems Pakistan is no more like " KOI FARAQ NAHE PARTA". 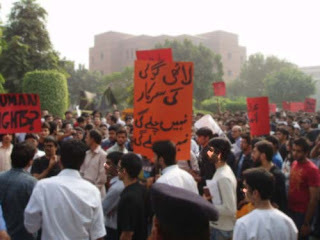 In one of the protest in LUMS, one of the young man shouted " YE MULK kisse ke baap ka nahe HAMARA hai" .. Honestly I felt like Pakistan sure has a few people who own it and it is sooo healthy to see our youth claiming that. No matter how long this takes, our next generation will surely see a Pakistan where JUSTICE RULES not BOOTS.